Give A Hand at McDonald's to Help Families at Atlanta Ronald McDonald Houses! 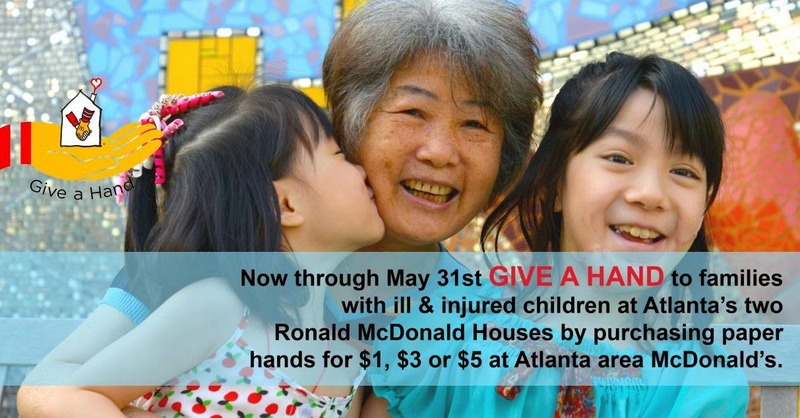 Give A Hand is a McDonald's tradition where customers are able to donate directly to Atlanta Ronald McDonald House Charities (ARMHC) by purchasing paper hands for $1, $3 or $5. Customers can display their Hand in the restaurant to show their support for RMHC. Last year, customers donated more than $198,000 to ARMHC - help us exceed that goal this year! Visit a participating Atlanta area McDonald's restaurant throughout the month of May to purchase your Hand to benefit Atlanta's two Ronald McDonald Houses! - Host a "night out" at McDonald's and ask everyone purchase a Hand. - When visiting McDonald's to purchase a hand, take a picture and share it on your social media pages and tag ARMHC. - Create office teams to see which team can collect the most hands throughout the month. - Host a "jeans day" at the office where employees can wear jeans for a $1, $3 or $5 donation towards Give A Hand. The office can then visit McDonald's for lunch and purchase their hands together.